Nottingham Caribbean Carnival is an extraordinary story of development, resilience and community spirit. The Nottingham Carnival, from its origins in 1858 to present times, has provided a rich creative landscape for carnival arts and community participation. 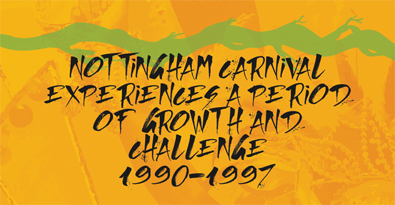 The Nottingham Carnival Heritage Project (NCHP), funded by the Heritage Lottery has provided a platform to explore Nottingham Caribbean heritage from 1958-2002 and its relationship with the development of Nottingham Caribbean Carnival. The research unearthed during this project highlights personal narratives, artefacts, documents, photographs, press cuttings and oral recordings that tell the story of hardship, resistance and community activism, have all been instrumental in the great success in the development of Carnival History in Nottingham. Nottingham Carnival Heritage Project has created a physical and digital exhibition (DVD and online)using resources, stories, newspaper cuttings and artefacts collected throughout the project, as well as unseen video footage, showing the rich and diverse carnival heritage in Nottingham. Volunteering and training has played a substantial and fundamental role in this project. Volunteers have been involved in collating archival material to be used on the website and exhibition. Young people have successfully completed digital and social media training where they have produced a short film, developing new skills and confidence whilst providing opportunities to share and support carnival arts and heritage. 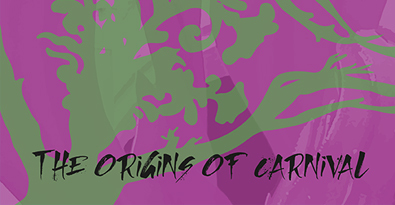 The origins of carnival gives a general overview of the origins of carnival history between European and African carnival traditions and customs. This panel also looks at the slave trade, colonialism, resistance, religion, freedom and celebration. The 50’s brought a new wave of people from the West Indies to England. 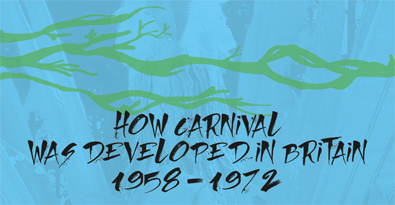 The development of carnival explores the need that rose from migration and challenges to re-establish identity and nurture cultural roots during a time of unemployment, racism and discrimination. This board contains personal stories about the Empire Windrush, multi-cultural Britain and the social and political catalyst that fuelled race riots in St Ann’s, Nottingham in 1958. 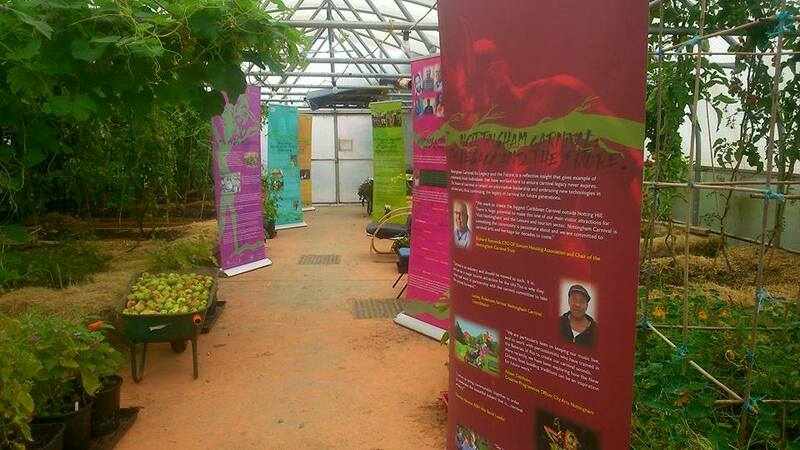 Exploring community activism and highlighting personal stories about Carnival organisers, James‘ Woody’ Heyliger, Andrew Main, John Wray and the St Kitts and Nevis Community in St Anns, Nottingham. The 90’s was an extraordinary decade of activity and decline for the Nottingham Carnival. In the early 1990, a new carnival committee with William Stewart as Chairperson, was formed and local people organised themselves and worked together to apply for funding through Nottingham City Council, and sponsorships with local organisations. The 90s explored the introduction of new sounds within the carnival arena, where samba,reggae, raga, soca, hip-hop and gospel music.The mid 1990s saw the carnival under new management through Leslie Davis and Delroy Brown. 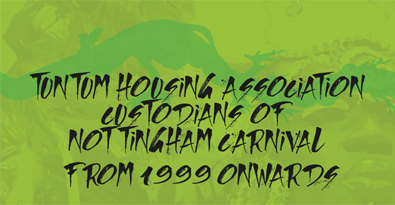 In 1999 Tuntum Housing Association took the lead to manage the Nottingham Carnival after it was cancelled by the council in 1998. Tuntum Housing Association, a charitable social enterprise, set up in 1988, offers housing and support services for people on low incomes, providing over 1,100 homes for the people of Nottingham. From 1999 Lesley Robinson was one of the key organisers at this time, establishing contacts with the East Midlands Arts Board and the Arts Council England. A strategic approach supported the infrastructure of carnival development, bringing funding opportunities and a new wave of interest in learning traditional skills and carnival art and skills from Europe. It’s important to recognise the pioneers of carnival from its very humble beginnings in 1958 to the present day. It has not been possible to hold portraits of everyone involved in Nottingham Carnival’s history, but we have tried to include the majority of people found within our research and those who are involved in carnival to date. 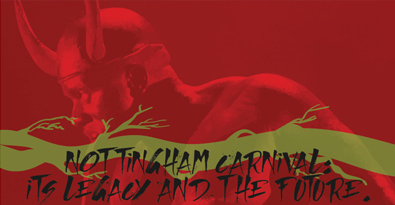 Nottingham Carnival now is a reflective piece of information that gives examples of statements from individuals that have worked hard to ensure the Nottingham Carnival legacy never dies. 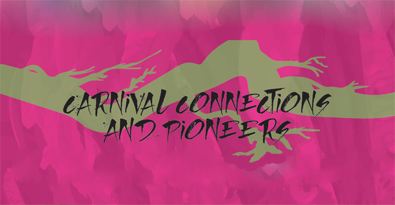 The future of carnival is reliant on new entrepreneurs and informative leadership where traditions of the past can seamlessly evolve and adopt new forms of Carnival arts, to continue the legacy for future generations. 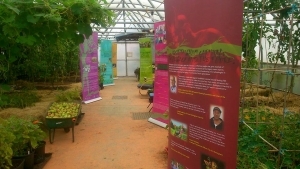 The Nottingham Carnival Heritage Project created seven exhibition banners to document the heritage of the Nottingham Carnival.